Thanks everyone who entered into last weeks Easel Card challenge. Wow, did we have some beautiful cards! It’s so fun to travel around seeing everyone’s creations, a big thank you to everyone who played along! Our challenge this week is a theme challenge! We challenge you to make cards “for the girls”. Cards that our hero’s can send home to their female loved ones! Big girls, little girls, any occasion, birthday, anniversary, love, miss you – I’m sure you have lots of great ideas! Our sample card this week was made by Heidi-Mari and I have a wonderful bio from her too so we can get to know her a little better. Hello, I’m Heidi-Mari Lues, I am 13 years old. 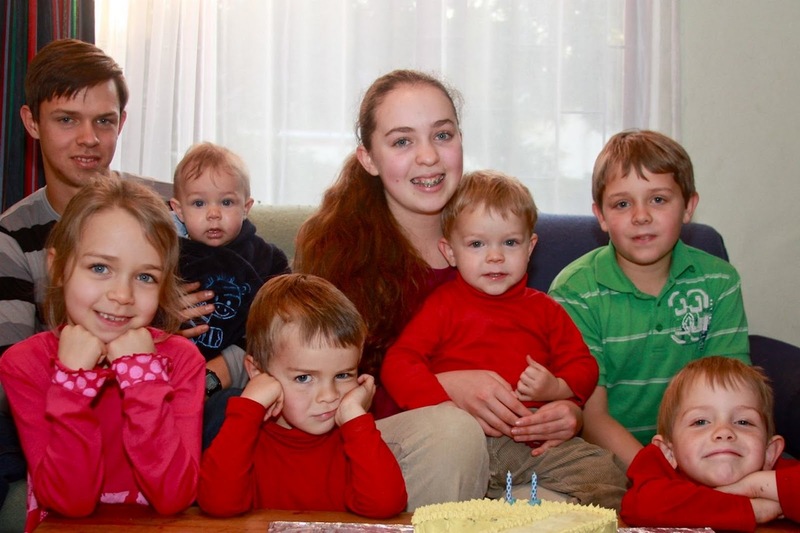 I live in Cape Town, South Africa with my parents, one sister and 6 brothers. We are all home schooled by our brave parents. With my ninth birthday my mother gave me a book on how to do Scrapbooking. We did a few classes on how to Scrapbook and we learned a lot. Towards the middle of last year, we ran out of scrapbook ideas, so we searched the internet. 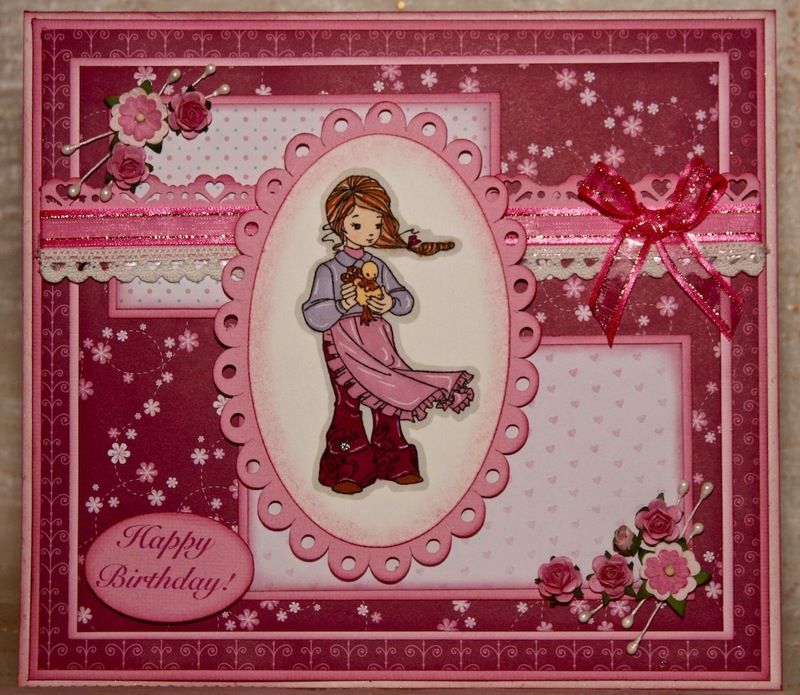 We couldn’t find Scrapbook blogs, only card making blogs and challenges! So I tried my hand at card making and just loved it! I enjoy card making more, because it’s much quicker to make a card than a scrapbook page. Since my mother and I only scrapbooked once a week, for a few hours, I would get bored with a scrapbook page. I used to work on one scrapbook page for several weeks, now I can make a card in one or two nights. We still work only once a week, but my mother gives me ideas, and I do the rest by myself. When I wanted to start taking part in challenges, I needed a blog to publish my cards. My mother already had a blog, so she helped me start it and now I can do it all by myself. My little sister Danika, of 7, loves card making just as much as I do. Danika and I also love Ballet and we attend ballet classes every week. We had our annual ballet concert this year and my mother made our costumes. My mother loves making clothes for Danika and myself. I’m really honoured to make a sample card for this challenge! To see more of Heidi-Mari's wonderful art work please visit her blog Heidi's Crafts . Thank you Heidi-Mari for sharing your awesome creativity with us! Heidi-Mari, you are so talented and I love your card. It was fun to read about you and your family; keep up the great work! That's an amazing card! I love it. WOW! What an AMAZING card! Loved all the detail work! Beautiful! 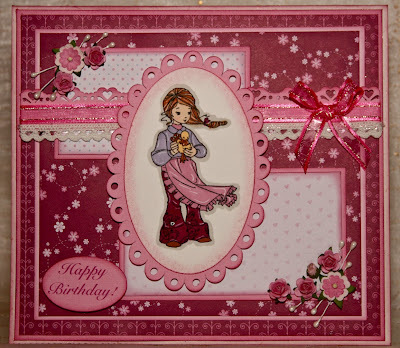 Miss Heidi-Mari, you have a wonderful talent and love your card. Keep up the great work and have fun with it. Thank you for sharing part of your life and your talent. The cards are all lovely.